The plumber in this beautiful game is not called Mario, but Angelo. Rumour has it that he may be distantly related to Mario and Luigi, butwe just cannot say for sure. However, it seems that having to defend oneself against the turtles is widespread in Italy. In Super Angelo you can expect many great levels and, of course, secret passageways. The game is played using the arrow keys. If you have unlocked the ability to shoot, you can do this with the X button. You can select a level by clicking the 'enter' key. You can enter the secret passages by walking directly above them. 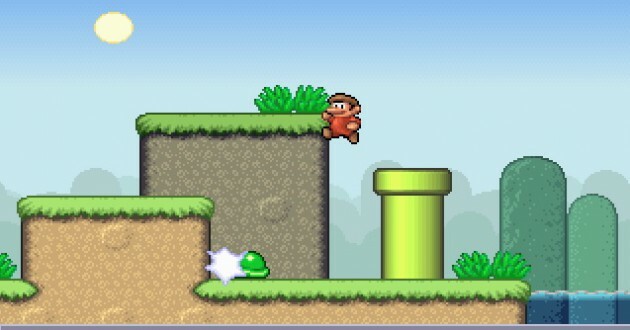 You then automatically enter into secret levels where you can collect lots of coins and unlock special functions. At the beginning, Super Angelo only has three lives, so trying to get as far as possible from the start is paramount. Even if his name is not Mario, this is still a very nice game. All the expected functions are available and, as with all platform games, you can spend a long time playing. Unfortunately, the graphics are not quite as nice, but there is, at least, an ancient atmosphere and large template. We recommend that you play the Super Angelo game which we are happy to have on the page. Beautiful Mario game that is very much orientated towards the Giana Sisters. Do you like Super Angelo? If you like Super Angelo, please click on the Facebook Like Button. With help of the likes on games, we generate our top 10 charts.